Detailed Description: Schneider Electric / Square D OsiSense® XML Electromechanical pressure switch of size 70 bar is used to measure pressure of hydraulic oils, fresh water, seawater, air and corrosive fluids. It has a fixed differential scale type for detection of one single threshold. Pressure switching point is adjustable from 5 - 70 bar on rising pressure and 2 - 62.5 bar on falling pressure. Switch gives a possible differential of 3 bar at low settings and 7.5 bar at high settings at a maximum permissible pressure of 90 bar per cycle. It has a current rating of 0.1 Amp at 250 Volts, 1.5 Amps at 240 Volts and 3 Amps at 120 Volts. Switch is provided with a zinc alloy enclosure for high strength and durability. It has a piston pressure actuator and a local display for convenience. Switch has snap-action auxiliary contacts and silver contacts for high conductivity. It withstands a maximum permissible accidental pressure of 160 bar and a destructive pressure of 320 bar. It has C/O contact type and G 1/4 female fluid connection type. Switch has screw-clamp terminals for electrical connection and an entry tapped, cable gland to accommodate cables of 9 - 13 mm. Switch operates at a rate of 60 cycles/minute and provides mechanical durability of 600000 cycles. It measures 35 mm x 113 mm x 75 mm. It is included with a type gG, 10-Amps cartridge fuse for short circuit protection. Switch has four terminal block type. It operates at a temperature of -25 to 70 deg C and can be stored at a temperature of -40 to 70 deg C. Switch is IP66 rated for use in hazardous locations. 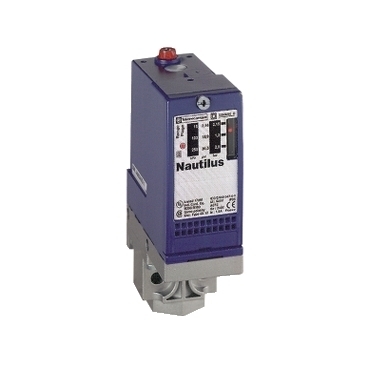 Switch is UL listed, CSA certified and meets CE/EN/IEC standards.